Kate Middleton and Prince William have proved that they’re not willing to play it traditional when it comes to their family. 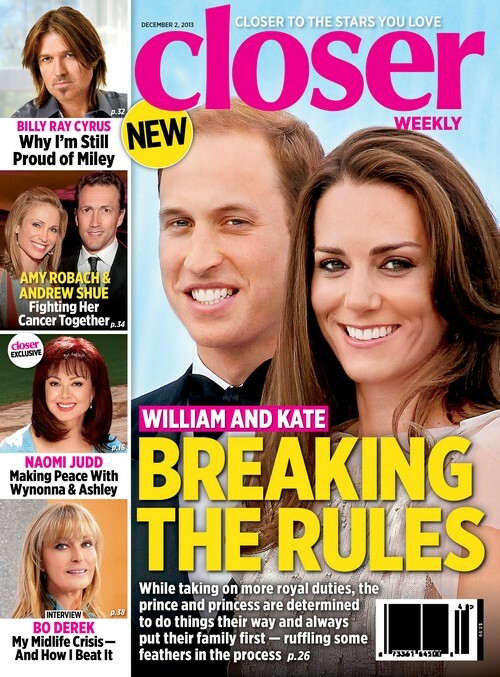 The new issue of Closer Weekly has all the details on Kate and William: Trailblazers. In all honesty, they are setting a precedent for every royal family that comes after them, basically stating that putting your children above your royal family and tradition is a priority, and should be allowed. Unfortunately, Princess Diana wasn’t afforded the same gift of choice, and her relationship with Prince Charles was too fractured for them to go after this kind of balance. Kate and William, on the other hand, have already achieved it. Granted, it’s made a lot easier by the fact that they have an endless stream of income and don’t have to do much to maintain their standard of living. But even then, Prince William and his wifey have shown that while taking on more royal duties, they will always put Prince George before anything else. George’s christening is the perfect example: if you go by ‘tradition’, camera crews would have been allowed and the guest list would have filled several halls alone. But nope, not with Will and Kate. They wanted George’s ceremony to be an intimate experience, and they probably didn’t want their son spooked by the attention and the media – so they went with a smaller venue and smaller guest list, breaking tradition along the way. Of course, their way of doing things is going to ruffle some feathers, especially among the older contingents in the royal family. I doubt Queen Elizabeth gives a damn, but there are other people who feel that Will and Kate aren’t following royal protocol and royal tradition, and are ticked off after the fact. But do Will and Kate care? I highly doubt it. Kate Middleton and Prince William Ask Princess Diana’s Nanny Jessica Webb to Care for Prince George – Only Person They Trust! Kate Middleton’s Royal Son Versus Penelope Cruz’s A-List Daughter: Who Is The Better Baby?